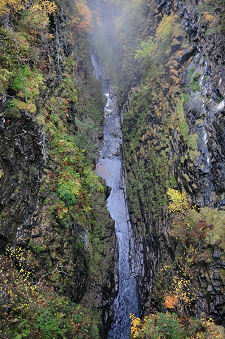 Corrieshalloch Gorge can be found 12 miles south east of Ullapool. 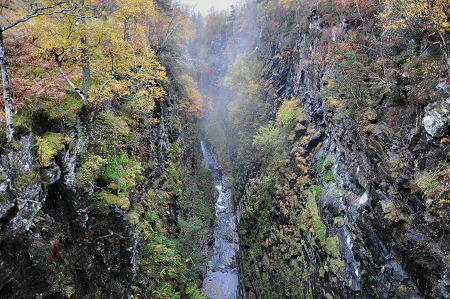 It is a spectacularly deep, mile long box canyon through which the River Droma descends towards Loch Broom, en route forming the 150ft high Falls of Measach. 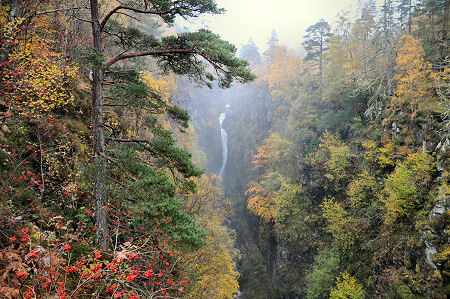 There are few outdoor attractions in the Highlands best seen after heavy rain, but Corrieshalloch Gorge is certainly one of them, and when the river is in spate the falls produce a mist which drifts along the gorge. The gorge is accessed from the south, from a car park a short distance west along the A832 Dundonnell and Gairloch road from its junction with the main A835 Inverness to Ullapool road. There was a time when access to the Corrieshalloch Gorge was from the north, from a layby on the A835, and entailed crossing this busy main road at on a section with very poor sight lines. There is now no access possible from the north and the new car park allows much safer access along a well graded zig-zag gravel path that descends 200ft down into the gorge. The path brings you to the south end of the Corrieshalloch Suspension Bridge. This was built to allow tourists a better view of the gorge in 1874 and designed by the eminent engineer Sir John Fowler. Sir John is perhaps better known for his role in helping design the Forth Bridge, on which construction began nine years later in 1883. His bridge over the Corrieshalloch Gorge is more modest in scale, with a span of 82ft, but it has nonetheless stood the test of time. The bridge gives you your first real sense of what you have come to see, and if you have any sort of fear of heights, crossing it is a challenge. A few feet out onto the bridge you suddenly become aware of the drop of some 200ft into the gorge below, and the bridge itself has an interesting tendency to sway as you walk along it. This is one reason why the number of visitors allowed on the bridge is limited to six at any one time. From the bridge you follow a path west among trees parallel to the north side of the gorge. This brings you to a viewing platform cantilevered out half way over the gorge from the north side. This is a more recent addition than the bridge. 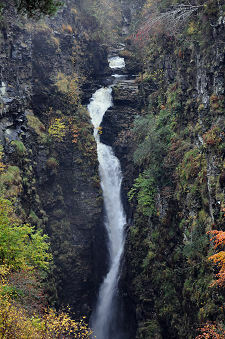 It offers stupendous views of the Falls of Measach to the east: and provides another stern test for those with vertigo. On the way back to the car park you can choose to return the way you came or, after recrossing the bridge, you can follow a path which takes a circular route, leading first along the south side of the gorge to another fine viewpoint. The Corrieshalloch Gorge was not carved out by the river that flows through it today. Instead it was probably formed towards the end of the last ice age when the glacier that formed Loch Broom started to melt and large volumes of water flowed beneath the base of the glacier, carving out the rock below.